For a lot of you, high humidity isn’t much of a concern, except in the depths of summer. Here in Florida, though, it is basically a year-round problem. I’ve been fighting—and usually losing—the battle against high humidity ever since we moved here in 2005. 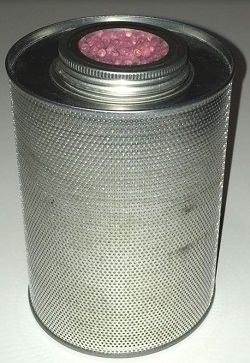 Finally, I believe I’ve found a weapon that works: a desiccant canister designed primarily for gun safes from Liberty Safe and Security Products. Now, I’m not a fanatic about humidity levels. For one thing, years of monitoring have shown me that it is virtually impossible to maintain an exact point. But there is certainly a danger in cigars being ruined by far too much or too little humidity. Generally, I aim for a range of about 61-67% relative humidity. However, achieving that is no small task. Since high temperatures are also a major concern here, I’ve used a cooling unit from the start. I ran through a couple of coolidors, which did OK, but didn’t seem to last too long. Then, about seven years ago, I purchased a Cooled 1200 Refrigerated Cigar Cabinet from Avallo Humidors in Nashville. I’ve been pleased with the unit and the service from Matt Allen, the owner of Avallo. In addition to cooling, the Avallo also has an automated system to measure and add humidity. Of course, it’s rare that I have to add moisture. Getting rid of it is my problem. The list of what I’ve tried seems endless: tons of beads, mountains of kitty litter, jars and jars of gel, a self-contained dehumidifier—and anything else that seemed like a possible solution. None of it really worked. I have a Xikar PuroTemp Wireless Hygrometer System with a sensor on each of the two sliding shelves to monitor temperature and humidity so I can easily tell when either is getting out of control. For the past couple of years, I have resorted to DampRid or a similar absorbent material when humidity spiked. While it does reduce humidity, it also involves guessing how much to use and frequently checking the rising water level to make sure it doesn’t overflow. Recently, I did another internet search to see if there was something I hadn’t tried. That’s when I spotted the Liberty canisters. They come in three sizes (40 grams, 450 grams, and 750 grams), with prices ranging from $6.49 to $15.99. Rather than wait for an online order, I checked gun shop websites for local availability. Fortunately, a shop nearby stocked them, and I bought the large canister. All that was required to put it to use was to heat it in the oven for a couple of hours while the material inside dried out. When it was cool, I put it in the humidor and… Voila! It sucked the moisture out of the air. I removed the canister when the humidity was down to an acceptable level, ready to re-heat and re-use again when necessary. So far, I’ve employed it several times, and it has worked like a charm. No worry about water spilling, no wondering why nothing is happening. Right now, it’s my favorite cigar accessory.